The hip muscles are notoriously tight and sore for runners. We use some of those muscles directly as we run, and the others work to help stabilize our hips and legs. In fact, when I teach yoga classes to runners, I’m always hearing requests for more hip openers. 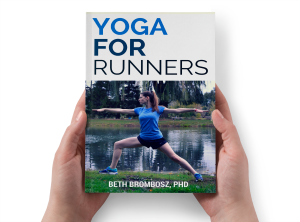 Today I wanted to share my favorite yoga poses for runners’ hips. 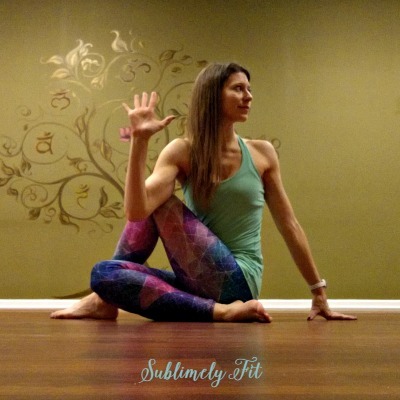 These poses will help you loosen tight muscles and connective tissue. Your hips will feel so much better after trying these poses! DISCLAIMER: I am a yoga teacher, but I’m not your yoga teacher. If you have questions about how to modify a pose for injuries or other reasons, ask your yoga teacher. Always consult with your medical professional before trying any new fitness routine. I love Lizard Lunge because it’s easy to modify or intensify the pose. So, you can easily feel more or less stretch, depending on how you position your body. You can come into Lizard Lunge directly from a low lunge by simply shifting your front foot toward its outside edge. Or, if you’d like a more intense stretch, start to inch your front foot toward the top corner of your yoga mat. Then, allow your foot to fall to its knife edge, your knee falling with it. Once you position your foot and your leg, you have a few options for where to put your upper body. If you’re very tight, you can stay up on your hands. You could come down to your elbows and rest your forearms on a block. Or, if you’ve been practicing this pose for a while, you can bring your forearms to the mat. The most important thing in Lizard Lunge, like any other hip opening yoga pose, is to find the right amount of stretch for your body. If you do too much at once, your body will lock up (or worse, you could get injured). It’s better to ease up a bit and find a comfortable stretch for your body. Remember, your body will be different every day, which means your pose will be a little different every day. Cow Face Pose is another great pose for helping to open the outer hips. Full Cow Face Pose also involves a bind with the arms, but it’s tough for people with tight shoulders. 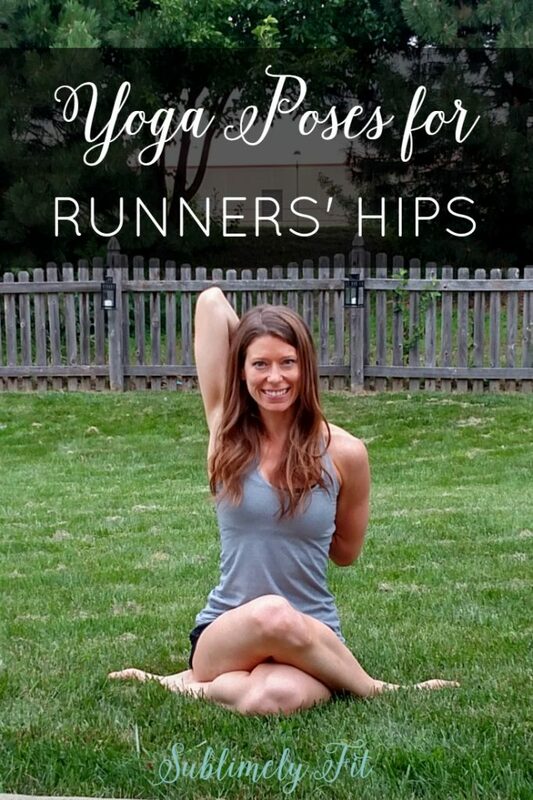 If your goal is to simply focus on your tight runners’ hips, just focus on your lower body. You’ll work toward stacking your knees so one is directly above the other. However, if you’re a runner, you’ll probably be too tight to get your knees to line up, and that’s okay. You can leave some space between them. You can also try Reclined Cow Face Pose, which is a little less intense and is a great way to work up to this pose. Lord of the Fishes pose is a great way to stretch some of the deep hip muscles such as the piriformis and gluteus medius. And, it’s also a great outer hip and thigh stretch, too. If you’re new to this pose, simply begin by turning toward your top leg. As you become more flexible, you can wrap your arm around that leg, pulling it closer for a deeper stretch. 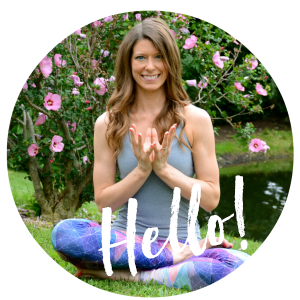 If you’re like me and it seems like you’re always fighting a tight piriformis, you’ll love this pose! Runners really love Pigeon Pose because it’s so effective at opening the hip muscles that get tight during and after running. If you’re very tight in your hips, I recommend starting with a Reclined Pigeon Pose. When your hips are open enough, you can move on to Pigeon Pose. Here I’m demonstrating what’s sometimes called Sleeping Pigeon. 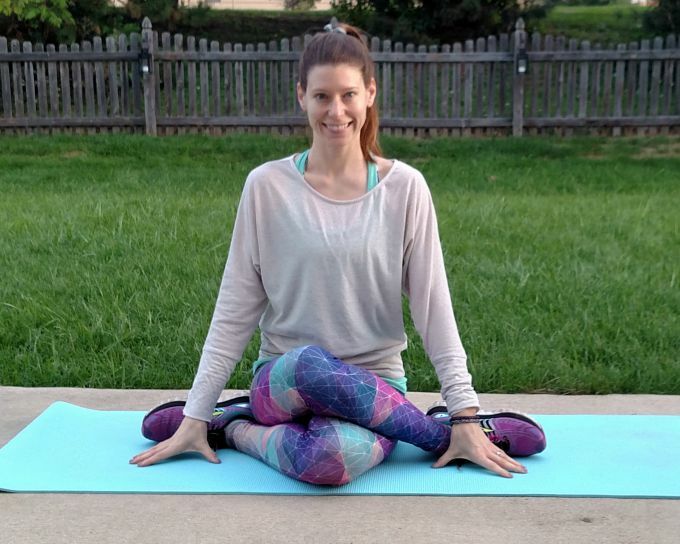 Click here for a step-by-step description of how to get into Pigeon Pose. 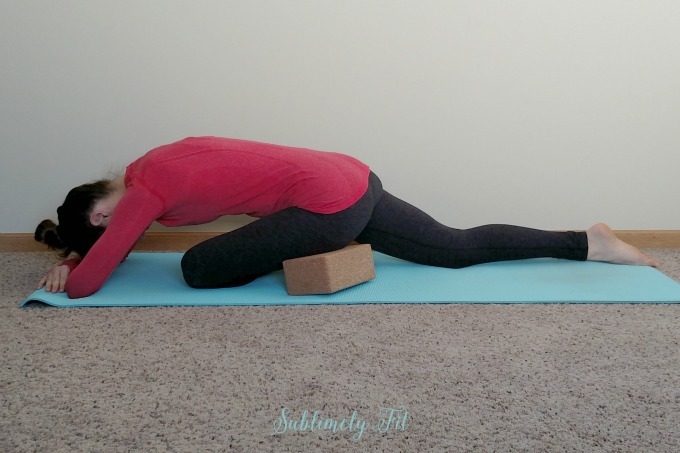 You can use a block beneath your hip to give you extra support, which often feels great to runners. Adjust the block’s height to what feels best to your body. This photo is showing Reclined Bound Angle Pose (Supta Baddha Konasana), but you can also try this seated as well (Baddha Konasana), sometimes also called Butterfly Pose. This pose is a great one for helping you to gently open the inner thighs. If you’re spending time opening and lengthening your outer hip and thigh muscles, you need to lengthen your inner thighs, too. Otherwise, your muscles will start to become imbalanced, which can lead to injury. I love pigeon pose (who doesn’t?) but favorite hip opener is lizard lunge. So effective! I love pigeon pose! I can’t do cow face, though. That’s very tough and awkward for me. Been having hip issues lately! I know I need to do pigeon and cow more often. Pigeon pose and Butterfly pose are my faves when it comes to hips! Lizard Lunge has changed my life!!! Lizard Lunge also changed my life too, but not in a good way. Be very careful when rolling your foot outward. I burst the bursa in my foot just above my little toe. It took over 9 months to heal and gets inflamed quite easily now. I love to recommend pigeon pose to my runner friends. I often start with pigeon pose before every run to stretch my hip, back, and knees. Yoga is indeed a good activity and it is good for your body tho.